It now appears that a major contributing factor to the abrupt shutdown of the Russia-Trump probe by the House Intelligence Committee was a fear that the Committee was getting too close to Trump’s dealings with Deutsche Bank and Deutsche Bank’s dealings with Russia. “We write seeking information relating to two internal reviews reportedly conducted by Deutsche Bank (“Bank”): one regarding its 2011 Russian mirror trading scandal and the other regarding its review of the personal accounts of President Donald Trump and his family members held at the Bank. What is troubling is that the Bank to our knowledge has thus far refused to disclose or publicly comment on the results of either of its internal reviews. As a result, there is no transparency regarding who participated in, or benefited from, the Russian mirror trading scheme that allowed $10 billion to flow out of Russia. Likewise, Congress remains in the dark on whether loans Deutsche Bank made to President Trump were guaranteed by the Russian Government, or were in any way connected to Russia. It is critical that you provide this Committee with the information necessary to assess the scope, findings and conclusions of your internal reviews. Waters’ letter to the CEO of a major global bank which has complex major dealings all over Wall Street might take one’s breath away unless you have been closely following the serial crime spree that Deutsche Bank has been conducting in other corners of the financial markets in the U.S. and abroad. Deutsche Bank was criminally charged by the U.S. Justice Department in April 2015 and allowed to enter into a deferred prosecution agreement. The charges were related to its role in manipulating U.S. Dollar LIBOR and engaging in a price-fixing conspiracy to rig Yen LIBOR. (LIBOR is an interest rate benchmark used to set consumer loan rates.) At the same time, a bank subsidiary pleaded guilty to wire fraud for manipulating LIBOR. 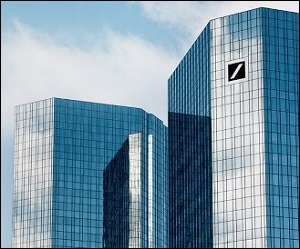 The settlement cost Deutsche Bank $775 million in criminal penalties. In November 2015, Deutsche Bank was fined $258 million by the New York Department of Financial Services and the Federal Reserve for using “non-transparent methods and practices” from 1999 to 2006 to move money in and out of countries on the U.S. sanctions list. Emails showed that employees had discussed tricks for conducting financial transactions with Iran, Libya, Syria, Burma and Sudan. In 2013, FHFA, the conservator of Freddie Mac and Fannie Mae, announced a $1.925 billion settlement with Deutsche Bank to resolve claims that the bank had misled the mortgage giants in the sale of mortgage-related investments. Deutsche Bank did not admit wrongdoing in that settlement. In 2010, Deutsche Bank agreed to pay $553.6 million to the U.S. and admitted criminal wrongdoing in a fraudulent tax shelter scheme that facilitated billions of dollars in U.S. tax losses.